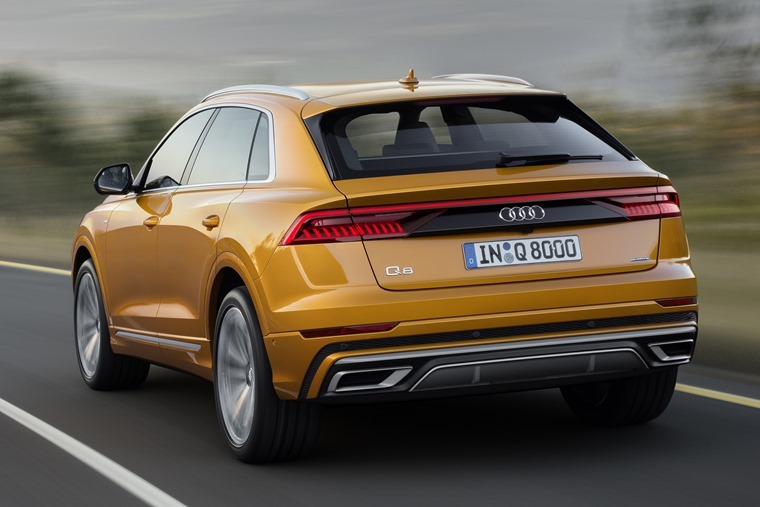 The first official pictures of the new Audi Q8 have been revealed, and it’s set to cost from around £60,000 when order books open later in the year. 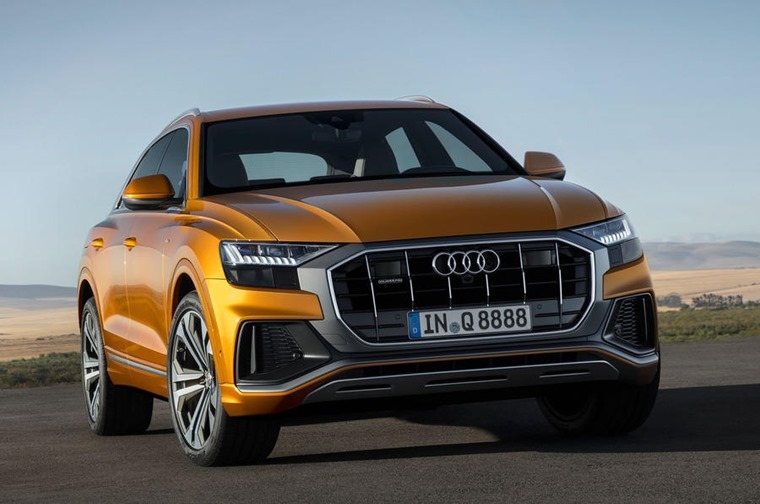 Despite actually being a little shorter than the latest Q7, it’s the Q8 that is set to be the brand’s new flagship SUV and is set to rival cars such as the BMW X6 and Mercedes GLE Coupe. We’ve had a good idea of what the Q8 will look like for a while now, and in production form it’s almost as striking as the original concept. The front of the car is dominated by a large one-piece grille that takes inspiration from the original Audi quattro. A swooping, shorter roofline gives it a much more aggressive look than any Audi SUV to date. This is aided further by those angular headlights and air intakes at the front and sharp, thin LED taillights at the back. Step into the cabin and you’ll find a plethora of up-to-the-minute tech that’s all controlled through two touchscreens in the centre console just like in the new A8. A 10in screen manages infotainment and navigation while a lower 8.6in panel operates the climate control. Audi’s Virtual Cockpit sits in front the steering wheel in place of regular dials and is set to be a standard feature across the range. When it arrives in the UK, two trim levels will be available; S-Line and Vorsprung. Available in both four- and five-seat form, it’s an airy and more spacious car than some direct coupe-SUV rivals thanks to a slightly higher roofline. That also allows for an impressive 605-litre boot capacity, too. The Q8 also ushers in a host of driver assistance and semi-autonomous tech that’s already been seen in the A8, which will be offered in packs. From launch, the only engine on offer will be a 3.0-litre V6 producing 282bhp. 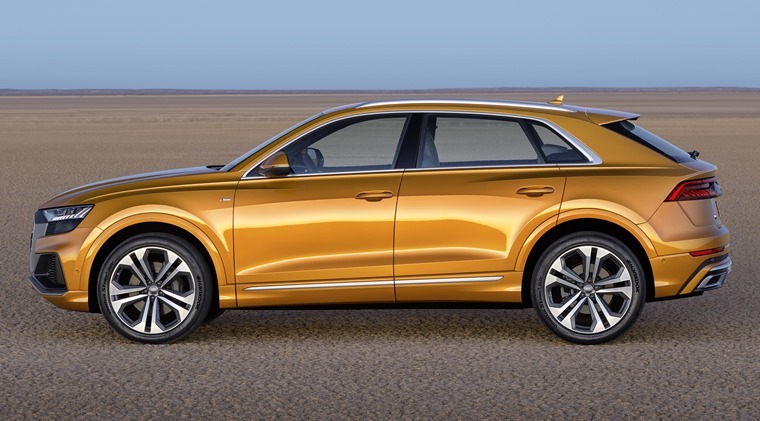 Under Audi’s new naming strategy, it’s badged as the Q8 50 TDI, it’ll get from rest to 62mph in 6.3 seconds and on to a top speed of 144mph. You can expect a 335bhp petrol and a less potent diesel to join the line-up in 2019 too, and every engine makes use of Audi’s mild-hybrid tech and benefits from the famed quattro four-wheel drive system. We’ll bring you the best Q8 lease deals as soon as order books open, but if you can’t wait, you can find thousands of Audi deals right now by clicking here. Alternatively, read about another new Audi SUV – the e-tron.